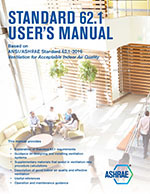 The 2010 edition of ANSI/ASHRAE Standard 55 combines Standard 55-2004 and the ten approved and published addenda to the 2004 edition into one easy-to-use, consolidated standard. The standard outlines conditions for environmental thermal acceptability. It is intended for use in design, commissioning, and testing of buildings and other occupied spaces and HVAC systems and for the evaluation of thermal environments. New updates to the standard include extended provisions for evaluating the impacts of elevated air speed, a new method for expressing and selecting air speed limits, and alternatives for determining the boundaries of comfort at air speeds above 0.15 m/s (30 fpm). It continues to focus on defining the range of indoor thermal environmental conditions acceptable to a majority of occupants, while accommodating an increasing variety of design solutions intended to both provide comfort and to respect today's imperative for sustainable buildings. 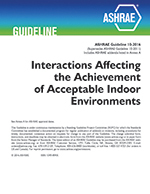 Section 6, Compliance, contains new mandatory minimum requirements for analysis and documentation of a design, and a new general satisfaction survey has been added as a method to evaluate thermal comfort in occupied spaces. The committee has also made significant editorial improvements to the comfort zone graphic and clarified requirements to avoid informative language.